The event took place in a community close to the capital, where the descent of a strange luminous object in a manioc field left the soil burned out and crystalized, burning a few plants as well. An amazing event that caused shock. Tuesday, December 15, 1981 was an important date for ufology in Corrientes due to the fact that two events occurred which were of extreme importance to the study of UFOs and their implications. The first, involving this article, was the apparent landing of an unknown object that left marks on the ground. The second is the Meneses Incident, which shall be described at a later date. In mid-1981, "something" landed around two or three in the morning on the property of a local smallholder, burning plants, leaving impressions in the soil, which was burned and crystallized due to possible high temperatures. El Litoral visited the location, alerted by rumors, to uncover the truth. It interviewed Sixto Barrios, 70, the owner of the property who said that only days earlier he and his family had seen strange lights flying around a wilderness near his home. He also added that two years earlier, an enormous object resembling a chunk of ice had crashed in the area, melting later on. "It was around two or three in the morning," he guessed, "when the dogs started barking like mad, but I didn't pay much mind, as they quieted down shortly after. I turned over and fell asleep again. They started barking once more and I fell asleep. Had I known it was such an odd thing, I would have gotten up to take a look. The next day around four in the afternoon, my relatives were working the manioc field and found strange marks and some plants completely charred. The soil was still hot, even though 12 hours had gone by," he noted. It was ascertained that some plants were burned and there were four large perforations in the ground, as if a very heavy object had landed on the spot. The impressions were asymmetrical and two meters from each other, at a depth of 30 centimeters, approximately. The soil around these perforations looked entirely burned out, vitrified, owing to the fact that the silica in the sand melts in this way when subjected to high temperatures. 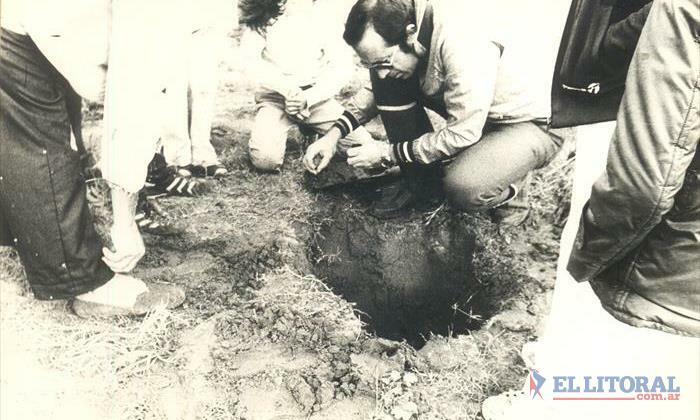 Analyses performed in Buenos Aires by Fabio Zerpa's team proved that the soil must have been subjected to temperatures ranging between 1500 and 1600 degrees centigrade at the very least - startling and irrefutable proof that something strange had taken place there. There are similar incidents in our country (such as the Guernica Incident in Buenos Aires) and around the world where practically the same thing has occurred to the soil. A major highlight: the high voltage wires from the Capital to the interior are some 500 meters from where the incident occurred, and the road joining Corrientes with Empedrado is some 350 meters distant. This is precisely one of the behavioral guidelines of the UFO phenomenon. According to the evidence and eyewitness accounts, it is evident that "something" landed in Derqui, leaving prints, charred vegetation, some with broken stems, and the soil around the indentations was crystallized due to the high temperatures experienced. Unfortunately, there were no direct witnesses to the case, given the lateness of the hour. No one saw a thing. Only the dogs barked incessantly. These are undeniable signs that something occurred. The physical evidence in conclusive, the facts speak for themselves. No one - not even with a blowtorch - could have melted the ground thus, or leave 30 inch marks on the ground, precluding the possibility that someone did this on purpose as could be suggested. Furthermore, who would take the time to do this in the dark in an unknown field? For what reason? It is without question another incident involving evidence in Corrientes during a term of approximately 10 years, during which it was the location for important and shocking events. Adding further significance to this event is the fact that on that same day, during siesta time, another case with spectacular characteristics took place in the vicinity: a driver was abducted, vehicle and all, and transported more than 100 kilometers from this initial location. This was the "Meneses Incident", which will occupy a special chapter in this column of El Litoral.